Known as the Cornhusker State, Nebraska is covered mostly by plains and prairies and sits atop the Ogallala Aquifer. The Missouri River separates Nebraska from Iowa and Missouri and flows along the eastern third of the border with South Dakota. Major rivers flowing west to east include the Niobrara, the Platte, and the Republican Rivers. The largest lakes are reservoirs including Lewis and Clark Lake, Harlan County Lake, and Lake McConaughy. With 11,000 miles of rivers and hundreds of lakes, less than 1% of Nebraska (480 square miles) is covered by water. What is Nebraska’s maritime heritage? People have lived in Nebraska for thousands of years. The earliest people specialized in big-game hunting while later people had a more diverse hunting and gathering lifestyle and used resources along lakeshores and streams. About 1,000 years ago, some people started farming along the river banks and living on the bluffs. Most people moved north during a period of drought beginning about 600 years ago, and new groups moved in when the drought ended. Indian groups historically associated with Nebraska were there by the 1600s and 1700s. In the 1700s, France and Spain vied for control of the Central Plains and the Missouri River valley. Etienne Veniard de Bourgmont is thought to be the first European to enter Nebraska when he accompanied a group of Missouria Indians up the Missouri River in 1714. Pedro de Villasur led an ill-fated expedition massacred by Pawnee Indians at the forks of the Platte River in 1720. Paul and Pierre-Antone Mallet with companions crossed Nebraska along the Missouri and Platte Rivers to open a trade route with the Spanish 1739. James MacKay, a fur trader working for a Spanish company, was in the Niobrara River valley in 1795-96. The United States acquired Nebraska as part of the Louisiana Purchase in 1803. In the decades that followed, scientific expeditions like the ones led by Meriwether Lewis and William Clark (1803-1806), Zebulon Pike (1806), Henry Atkinson (1819), Stephen Long (1820), and Benjamin Bonneville (1832) explored the area. Competing fur companies set up trading posts at Fort Lisa (1812), Cabanne’s Trading Post (1822), Pilcher’s Post (1822), and Fontenelle’s Post (1828), and the U.S. Army established the first fort west of the Missouri River at Fort Atkinson (1819). 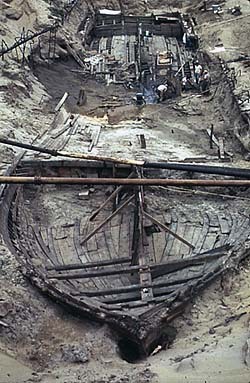 Flat-bottomed mackinaws and small draft bullboats and canoes were used by trappers and traders to navigate Nebraska’s shallow rivers, traveling downstream in the spring when the water was higher but running aground frequently and left abandoned sometimes because of low water. The first steamboat to travel up the Missouri River was the Western Engineer on the Yellowstone Expedition in 1819. An estimated 400,000 people passed through Nebraska between the 1830s and 1860s on their way west on the Oregon Trail, the California Trail, and the Mormon Trail. 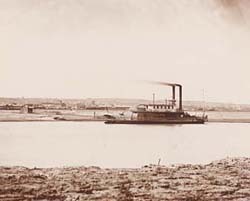 Sarpy’s Ferry (1846), the Lone Tree Ferry (1850), the Council Bluffs and Nebraska Ferry Company (1853), and numerous others carried travelers across Nebraska’s rivers. In 1848, the U.S. Army established Fort Kearny along the Great Platte River Road as a way station, sentinel post, supply depot, and message center for emigrants. Ferry service became obsolete and the fort was dismantled after completion of the transcontinental railroad. The Missouri River was the primary transportation highway between St. Louis, Missouri, and Fort Benton, Montana, until the railroads came west. Of the thousands of riverboats that passed through Nebraska, many of them wrecked due to constantly shifting and braided channels, sandbars, snags, and rocks. Other boats were lost to heaving ice, explosions, and fires. One unfortunate steamboat was the Bertrand that sank north of Omaha on its way to the Montana goldfields in 1865. The river channel shifted so much in the next 100 years that the site no longer was underwater but, instead, became buried on dry land when it was discovered and excavated. Artifacts recovered from the site are preserved for visitors to see at the DeSoto National Wildlife Refuge. 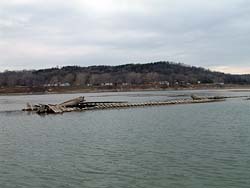 Some other riverboats lost along the Nebraska shore of the Missouri River include the Ontario sunk in 1866; the Amanda burned in 1867; the Bridgeport, the Carrie, and the Lillie all sunk in 1868; the Dalles and the North Alabama sunk in 1870; the Edgar sunk in 1884; and the Andrew S. Bennett sunk by ice in 1888.
Who takes care of Nebraska's underwater archeological sites? The Nebraska State Historical Society has overall responsibility for the state’s archeological sites. The Society accomplishes much of this work through its Archeology Division and State Historic Preservation Office. The Archeology Division is responsible for preserving, enhancing, exploring, and interpreting the state’s prehistoric and historic sites. The Division collects and maintains a database of information about archeological projects conducted in the state and sites discovered, and manages the state’s collections of archeological artifacts and records. The State Historic Preservation Office has a separate archeology program that is responsible for surveying, identifying, recording, and evaluating archeological sites throughout the state. The archeology program cooperates with the Society’s Archeology Division in maintaining the Master Archeological Site Survey records. The Society cooperates with the Nebraska Department of Roads in carrying out a program of survey and salvage when archeological, paleontological, and historical remains may be disturbed by highway construction. The Society works with the Nebraska Game and Parks Commission to investigate and preserve archeological sites in areas under the Commission’s jurisdiction. You need written permission from the Nebraska State Historical Society’s Archeology Division to conduct activities affecting archeological sites on state lands in Nebraska. What laws concern underwater archeology in Nebraska? Nebraska’s laws about State Culture and History are set forth in Chapter 82 of the Nebraska Revised Statutes. The Nebraska Archaeological Resources Preservation Act is codified in Sections 82-501 to 82-510. Related laws about the Nebraska State Historical Society are in Sections 82-101 to 82-132.